There are many ways of relieving or releasing stress, in fact, an industry seems to have grown on the basis of stress in everyday life. As a pastor in a small rural community, I still see stress and the effect it has on a person's ability to function in everyday situations. If we are to release stress from our lives, we must first be able to identify what stress is, exactly. Then, if it is healthy or unhealthy, and then how we deal with it without getting even more stressed by the process. Stress is shortened from the word distress and means "a force or a system of forces producing deformation or strain" in physics, according to the Collins Dictionary. For us it is a situation or accumaling groups situations that cause motivating pressure, that enable us to function effectively in our lives. In fact some stress is necessary and quite healthy providing we can cope with the pressures of the circumstances or situations. However prolonged and accumulative pressure causes us to become stressed and less able to function as the graph below shows. The blue line shows the tesion between effectiveness and pressure and the effect as pressure increases. While accompanied by the green line growth is healthy and the person copes with the pressure, but when the yellow line is reached effectiveness plateaus and warning signs such as cold sweats, headaches, sleeplessness, changes in behaviour (eating, touchiness, irritability, withdrawal, etc), shaking, breathlessness, palputations and sickness. 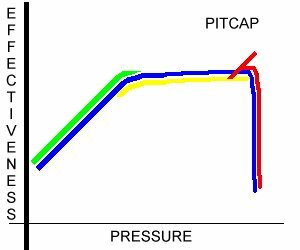 The red line crosses the blue at a point called PITCAP, this is the Percieved Inability To Cope As a Person. After this point much damage is done and the person ceases to be effective in everyday life, often called a breakdown.Therefore it would seem sensible to take action when the warning signs appear. Stress management seems to be the phrase that best describes the approach to be taken. In fact when someone says "don't worry", even if you weren't you start to, we must therefore not stop the pressure but find ways of coping with it. 1. Much stress is caused by our perception of a situation and our role in that situation. We often feel that we should be in control and when faced with circumstance beyond our control stress begins. We need to recognise that we cannot control everything in life but that God is in control. We should not forget that we are the sheep of his pasture, and that He is the good shepherd. Letting Jesus contol our lives does not mean that we can abdicate our responsibilities. There is a balance to be struck between personal responsibility and allowing God to be in control. The easy way to discover the difference in any situation, especially a stressful one, is to talk to Him about it. He is always there and always available. Often when I go to God with a stressful situation and my preconceived answer I find that I have a change of heart, and come away with a different perspective on the problem. In fact, I find sometimes it's not even my problem. Plan quality time with those you love. Spending a few hours with someone you love, a friend or spouse. Quality time is when the phone is turned off and you can talk and listen to each other, without interuption. Walk together and talk together, share a meal. Focus only on the other person,their feelings and their needs as they do the same. Make this time an oasis in your busy life. Plan quality time to exercise. Arranging to play a sport with someone like tennis or jogging. Physical exercise is a good way to burn off the frustrations we experience from pressure situations. As we get older this time might not be as energetic as a full game of soccer, but if we can go for a walk daily or have fitness schedule we will appreciate the difference it will make. Plan quality time for a hobby. This doesn't mean that you have to take up knitting but that is maybe just what you need. Something that is completely different to your daily routine. Go to night school to learn the hobby, maybe photography or medival history or computors. Don't limit yourself, why not learn to fly or sail or simply go fishing. A thing that I have never found particularly simple. Plan quality times of silence. In the hustle and bustle of everyday life we need to plan for and cherish times of silence. Silence for me is a walk along the beach and watching the waves break upon the shore, or walking in the forest, just listening to the birds. Strangely enough the other main time of quality silence for me is laying on our lounge floor in the presence of God, maybe listening to the latest worship tape or in complete silence listening for Him. We are so good in our quite times at being active, reading our bibles and praying, both of which are an excellant beginning to the time of silence. But how often are we still before God. The Psalmist says (46:10 niv) "Be still and know that I am God" another version says "Stand silent" written over 2500 years ago it still makes perfect sense. Why not stop for a moment right now and just feel the peace of God in his creation, just in a simple waterfall. 3. Allow the love of God to disperse any anxiety driven pressure that cause stress warning responses. We can experience his love through the body of Christ, his church and through the word of God revealed by the Holy Spirit. The following few verses from Isaiah are a great comfort to my wife, why not allow the Holy Spirit to reveal the word of God to you and shed abroad the love of God in your heart. That perfect love that drives out fear. Isaiah 43:1-3 But now, this is what the LORD says-- he who created you, O Jacob, he who formed you, O Israel: "Fear not, for I have redeemed you; I have summoned you by name; you are mine. When you pass through the waters, I will be with you; and when you pass through the rivers, they will not sweep over you. When you walk through the fire, you will not be burned; the flames will not set you ablaze. For I am the LORD, your God, the Holy One of Israel, your Saviour..."